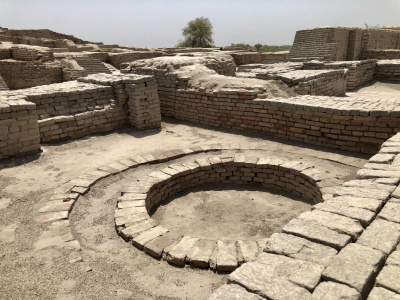 The Archaeological Ruins at Moenjodaro (or Mohenjo-daro) are the remains of one of the largest settlements of the ancient Indus Valley Civilization. Moenjodaro was the most advanced city of its time, with remarkably sophisticated civil engineering and urban planning. The site was divided into two sections: the acropolis with the major structures, and the lower town with private houses and commercial buildings. The ruins are located in Sindh Province, Pakistan. Mohenjo-daro is the modern name for the site, meaning 'Mound of the Dead'. The city was built around 2600 BC, and was abandoned around 1700 BC. It was rediscovered in 1922. Currently, the site is threatened by salinity in the ground water and improper restoration. As a site of one of the major archaeological finds of the 20th C Moenjodaro had long been on my target list. It is, however, what I might term an “archaeologist’s site” without the artistic or architectural “wow” of e.g. Egyptian sites, but we were not disappointed and enjoyed trying to understand its complicated and somewhat confusing remains and following the dig history and preservation problems.. It is worth realising that it wasn’t until 1924 that Sir John Marshall, DG of the Archaeological Survey of India (ASI), announced to the World the discovery of a new Bronze Age Civilisation about as old as those of Mesopotamia and Egypt. This discovery was made via digs at 2 sites – That at Harappa (almost 700 kms NE) commenced 2 years before that at Moenjodaro but, even though an alternative name given to the Indus Valley civilisation is “Harappan”, Moenjoraro has become the more iconic and the more usual one to be used in photos accompanying articles about the civilisation as a whole. The picture chosen by Els to introduce Moenjodaro on this web site is of a mound, topped by what turned out to be a ruined Buddhist Stupa from c 2nd C AD – and it was this which first drew attention to the site, but without any idea of what would be found there - “In 1921 Rai Bahadur Daya Ram Sahni conclusively proved that the remains at Harappa went back to a very early period, but to what period it was then impossible to say. The following year the late Mr RD Banerjee was deputed to examine the mounds of Moenjo-daro in Sindh, not with the idea that they were of any specially early date, but to explore what was thought to be the remains of an ancient Hindu city on parts of which there were the remains of Buddhist buildings. Mr Banerjee soon recognised the prehistoric character of the major part of the group of mounds by the discovery of seals and other objects similar to those found at Harappa” (EJH Mackay Jan 5 1934). Visitors to Moenjodaro have to decide which/how many areas of the town to visit and these are identified on the site maps by the codes assigned to them by Marshall. There are 4 main ones - DK, SD, VS and HR. Each is “named” after the ASI archaeologist initially given specific responsibility (So - DK = KN Dikshit, SD = AD Siddiqui, VS = MS Vats, HR = H Hargreaves). The dig was an enormous undertaking. The city occupies around 200ha and Marshall initiated largely concurrent excavations across it - he recorded that, in the 1925-6 season, he employed between 1000-1200 labourers. The dig reached over 38ft below datum but then hit groundwater, leaving the oldest stratigraphic layers unexplored. Excavations continued at a reduced level through the 1930s and restarted again in 1950 - the last was in 1964 but large areas remain unexplored. However, I have seen it said that UNESCO has forbidden any further digs other than for preservation/stabilisation and the Site Curator who we spoke to stated that it was the Archaeologists who created the greatest problems for preservation by excavating so much! The SD area is the prime one to visit – it is closest to the main entrance and contains the Stupa, the Grand Bath and the Granaries. If you climb up immediately to the Stupa you are at the starting level as in 1922 and have a fine view across the site. The next most important is the DK area which contains what is described as the “rich” residential area. Just these 2 are likely to take a good part of a morning if you give them reasonable time, as we did, before going back to our rest house for lunch. We then went out for a shorter afternoon, taking in the Museum and the VS/HR areas – finally walking back from these through the SD area again before leaving in mid afternoon to drive on to our next hotel in Sukkur. In all honesty, VS/HR did not add a great deal – they cover lower class housing and industrial areas. a. The original “Dancing girl” is on show in the National Museum Delhi. (It is well worth reading some of the quotes about this iconic statue – start with Wiki. b. The original “King Priest”, which some sources state is on show in the National Museum Karach, is not! Our Guide said that it is in a vault and only brought our occasionally to show visiting VIPs – he had only seen it once and we saw yet another replica. That museum is an unkempt disaster by the way. Only the Quranic display is well cared for. Marshall took both artefacts to the Capital of British India for display. I have read that Zulfikar Ali Bhutto tried to get them back under the 1972 Simla Agreement but Indira Gandhi told him to choose just one! Another interesting item on display are all the “Seals” with the, as yet undeciphered, Indus Valley script –though whether they are original or modern reproductions I know not. Moenjodaro is a bit “out in the sticks” some 30kms south of the nearest town of Larkana. There is a motel at the site but we chose to stay at the Archaeological Department’s Rest House (The Sindh Culture Dept’s plaque commemorating its renovation was dated Jan 2013!). We were the only persons there and occupied one of 3 VIP rooms, each with A/c, lounge area and en suite (we were told Benazir Bhutto had slept in ours but there wasn’t (yet??) a plaque to that effect!). We also had access to the very nice VIP lounge/dining/TV room!! In the evening we were visited by the site Curator and discussed some of the issues the site faces. He was adamant that the best method of preserving the bricks which are being crumbled by salinity was the technique of using salt-free mud either sprayed as slurry or placed as dried bricks on top. The theory is that this covering of mud prevents/reduces water seeping into the originals which would then draw up salinity. Elsewhere this technique has been described as a disaster. I couldn’t comment either way but my feeling is that Pakistan is faced with an almost insurmountable problem to preserve the original remains and, unlike at some sites we visited, is doing its best. We noticed a building in the grounds titled “Water & Soil Investigation Laboratory” and one notice at the site listed 11 different techniques being used (Horizontal and vertical damp proof courses, Removal of saline earth, Consolidation of decayed areas, Underpinning, Mud Pushtas (Buttresses), Wall topping, Mud capping, Desalinisation of the structures, Mud Poultice treatment and Drainage of the site). Meanwhile, beyond the site, Pakistani agriculture continues to depend on the heavy use of irrigation – one of whose effects is to raise the water table and increase salinity. So what does one see when walking around? As mentioned above, the Indus civilisation which used mud (both fired and unfired) as its main construction material rather than stone doesn’t seem to have been “big” on city monuments and statues – though there are plenty of small artistic artefacts in the museum. The “wonder” of Moenjodaro lies more in its planning and “civilised” organisation considering its existence between c3000 and 1500BC (peaking around 2500BC). So one finds oneself staring in wonderment at a lot of “Drains”!! The “Great Bath” is the largest easily identifiable structure, but understanding the stated purpose of many of the others requires a degree of faith - the so called “Granaries” for instance have never been related to any discoveries of grain. Similarly, for the so-called “Asembly Area” and even the “Fortifications”. Oh, and then there are the “Wells” – tall towers looking like chimney stacks (Photo 1) – these are in fact wells which have been built upon across the generations as new structures appear to have been erected on top of earlier ones always maintaining the earlier street and even room plans. The archaeologists have left all the bricks in place as they have dug down to earlier levels. Which takes us to the “Bricks”. Many (most??) of those on display are not original – the original archaeologists added many modern ones of their own (some have dates on them) and more recent preservation work has also interspersed even newer ones. Then there are the infamous unfired brick “toppings” and finally the sloping buttresses. Occasionally at ground level can be seen what are unarguably the crumbling remains of genuine original bricks with salt crystals glistening and destroying them (photo 2). PS. From a blog about Moenjodaro – “The Indus Valley Civilization people were non-muslims and kaffirs. Allah destroyed them. It is a sin to spend money of an Islamic state on a non-muslim historical site. Better to convert the whole area into madrassah so that no trace remains of our kuffaar past”. No doubt not a widely held view but, nevertheless indicative of the sorts of tensions present in Pakistan at the moment! Sindh is the Father of All countries. Thank my view about Moen Jo Daro are above. 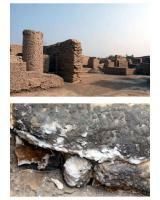 I visited the Moen-jo-Daro last sunday with my classmates.when we reached at this sight,we felt happy and enjoyed more and more with my classmates.We saw every famous places and observed that there is something wrong which is cleaness at kafeteria.So,i requested you should take some steps to make cleaness at this famous histirical place. I visited the site with my college (Notre Dame Institute) and it was the most rememberable experience I had. Witnessing one of the most oldest archeological ruins was an experience words can not express. According to the time period the people seemed highly civilized and having enough knowledge of an orgnised urban structure. But there was no information provided to us about the medical facilities they used, neither any medical artifacts was seen in the museum. Allover not a place to be missed by tourist. It was hot,dusty, and our guide didn't speak any English. So it were 2 lost days for us. Luckely the motel was very nice! Sir John Marshall: First discovered by the Archaeological survey in 1922. Major excavations commenced 1925 under Marshall revealing a large city built by a civilization contemporaneous with Sumer. His car is in the museum! Mohammad Reza Shah Pahlavi: The grounds of Mohenjodaro contain a monument to the "conference" there between The Shah of Iran and Sulfikar Bhutto on March 11 1976. Through to the early 1970s Iran and Pakistan had been close allies but differences began to arise in the mid 1970s - e.g Pakistani support for the Afghan Taliban. The Shah of Iran paid a State visit to Pakistan in March 1976. Moenjodaro is located in the Bhutto family's "home area". Given the use of Persepolis by the Shah to bolster his family's prestige the desire to show the Shah some Pakistani "culture" going back even earlier might have played a part in the choice of location! !